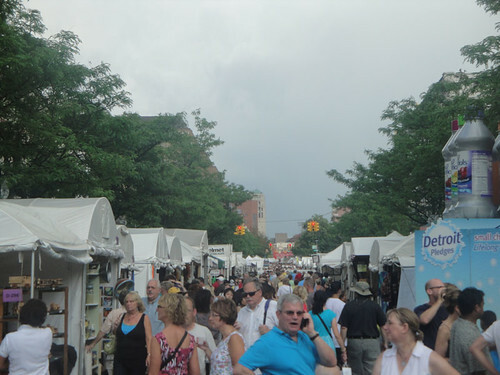 Posted on Sat, Jul 24, 2010 : 3:06 p.m.
Share your experience at the Ann Arbor Art Fairs with our readers! Click here for details on how to interact. Photo by Bradley Cross, 60, of Ann Arbor, taken Friday during one of the storms that blew through the Ann Arbor Art Fairs. From @shatteredhaven: Stoped raining & it's sunny & humid at Ann Arbor Art Fair. 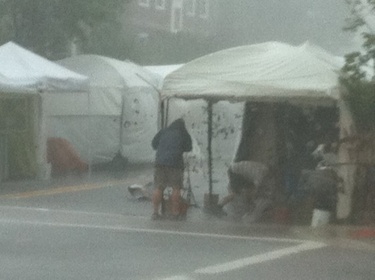 From @whatyatalknbout: thinks the Ann Arbor Art Fair is overrated. I just want to be able walk down Main street again! From @julietjun: I am not going to the art fair today. It is 100 percent thundershowers. On the AnnArbor.com page: From Bridget Held: my son and I had lots of fun even though we were in 2 thunderstorms today while there! I went running in the heat and humidity, and the rain felt really good! we were dancing and running in the rain and got soaked! Lots of fun! we're not going to melt and we only live once!! On the Ann Arbor Street Art Fair page: From Agnes Thorne: Seriously, there's going to be a great deal of loss this year. Tonight our not for profit booth and all our product was lost in the river of water that flowed down Liberty. We saw hats, shoes, product, pictures, and misc other floating down the middle of the road tonight. So sad! From Sarah Devereaux: My husband and I were there this evening and we felt so bad for the exhibitors caught in the monsoon. Hang in there!! We'll be back tomorrow! From Reveln Consults: The potters and jewelry artists have some protection of their medium. All the others, I hope they are ok & look to cheer you on Saturday. On the story "Fairgoers respond: What do you like best about the Ann Arbor Art Fairs? ": From Craig Lounsbury: what I like best is 6PM Saturday. I go once every 5 years whether I need to or not. Same with bowling. From MjC: I love how how our town is transformed into this beautiful and crazy world of creative art. It's energizing and, yes, exhausting - but I look forward to it each and every year.